Download Your CA CPT, IPCC and CA Final Registration Letters Online. In our previous articles, we have given CA Foundation, Intermediate and CA Final new syllabus applicable from May 2018. Today we are providing details about “How to download ICAI registration online? ". Today someone messaged me that “Sir, I have lost my IPCC registration letter. How to get duplicate IPCC registration letter? What is the procedure? Alternatively, is there any facility to download IPCC registration letter online? ". I replied, yes! You can download your IPCC registration letter online, and this facility is free of cost. The Institute of Chartered Accountants of India providing online facility to download ICAI registration letters. By this online portal, you can download CPT, IPCC, Articleship, CA Final and other important registration letters. Existing and new members of ICAI can also download respective registration letters. ICAI is providing following registration letters online! Intermediate (Integrated Professional Competence) Course. 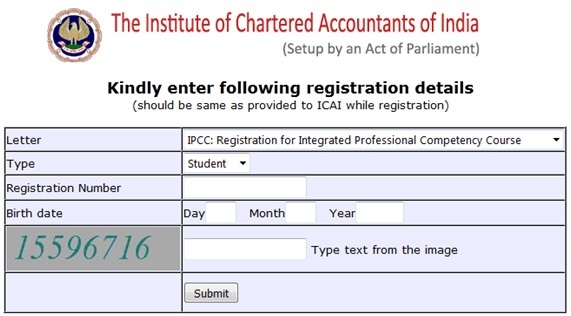 How to Download ICAI Registration Online? Follow below steps to download ICAI registration letter online. - Select Type: Member or Student. - Enter your registration number. - Enter your date of birth. - Type text from the image and Submit. I Hope this article will help you to download your ICAI registration letter. If you have any doubt, free to reach us at contactus@caprep18.com or on our toll-free number 1800-212-8575.. Share this article " Download ICAI Registration Acknowledgement Letter Online | CA CPT IPCC Final "to your friends, who are studying CPT, IPCC and CA Final.